On to Maharashtra, I made this one-pot rice and vegetable Bhaat which along with a simple raita would make a wonderful meal. The Varahadi Masale Bhaat is rich and well rounded. I chose to make this Bhaat because I loved the masala that went into it – fried onions, coconut, ginger, garlic and jaggery. Don’t worry, the Varahadi Masale Bhaat is not sweet. The jaggery and fried onion paste add a subtle sweetness that balances the heat from the red chilli powder but without making the dish sweet. I know a majority of us don’t like to mix spicy and sweet tones in a single dish. 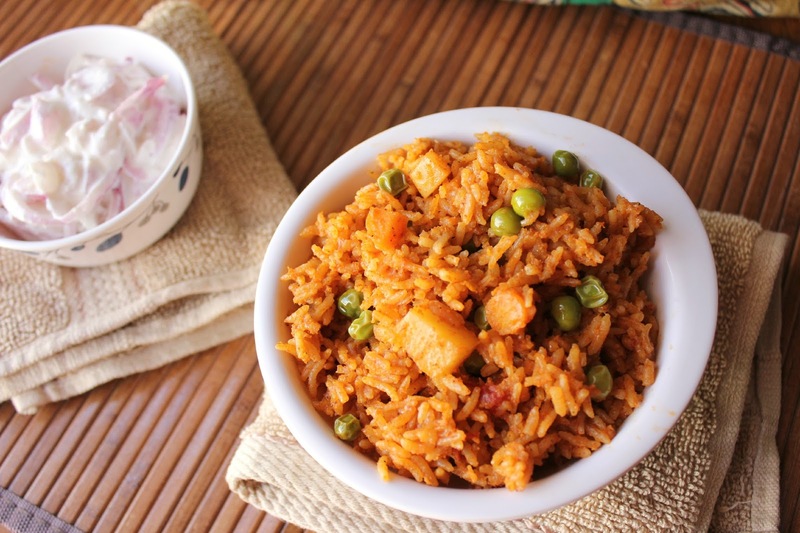 We use both in this Bhaat but in balanced proportions and the result is a wonderful aromatic one-pot rice dish. My kids enjoyed it a lot. Do adjust the red chilli powder and jaggery slightly to your requirements. Maharashtra on the western coast on India is one of the largest and one of the most populous states in India. Choosing a single dish to make from Maharashtra was a huge task. It is such a treasure trove of food. Choosing one was really difficult. I finally chose to make this slightly lesser known Varahadi Masale Bhaat (from here) especially because it was lesser known. I would love to make their misal pav, usal pav and batata vadas someday. 1. Rinse basmati rice in 2-3 changes of water till the water runs clear. Soak rice in water for half an hour. 2. Heat a pressure cooker or a wide, thick bottomed pan. Add the 2 tsp oil and the 1 roughly chopped onion. Fry till it turns nice and golden. Remove the fried onions with a slotted spoon to a plate. Set aside. 3. To the same pressure cooker or pan, now add ghee. When the ghee has melted, add the whole spices – bay leaf, cloves, cardamom (green and black), cinnamon and star anise. Then add the cumin. 4. Throw in the chopped onions and sauté till they turn translucent. Add the chopped vegetables – carrots, potatoes, beans and peas and mix well. Cook on low heat for a couple of minutes. 5. Meanwhile grind together the fried onions, ginger, garlic and grated coconut to a fine paste adding a little water if necessary. 6. Add the ground masala paste to the vegetables and mix well. Add in the red chilli powder, garam masala powder and salt and mix well. Add in yogurt and stir until it is completely incorporated. Add jaggery and mix well. 7. Cover and cook on low heat for about 15 minutes or till the vegetables turn tender. 8. Drain the soaking liquid and add the soaked rice to the vegetable mixture. Stir and add enough water to make up an inch above the rice-vegetable level. Cover and cook on low heat for 12-15 minutes. Switch off. Fluff up the rice with a fork. Serve hot with raita of your choice. 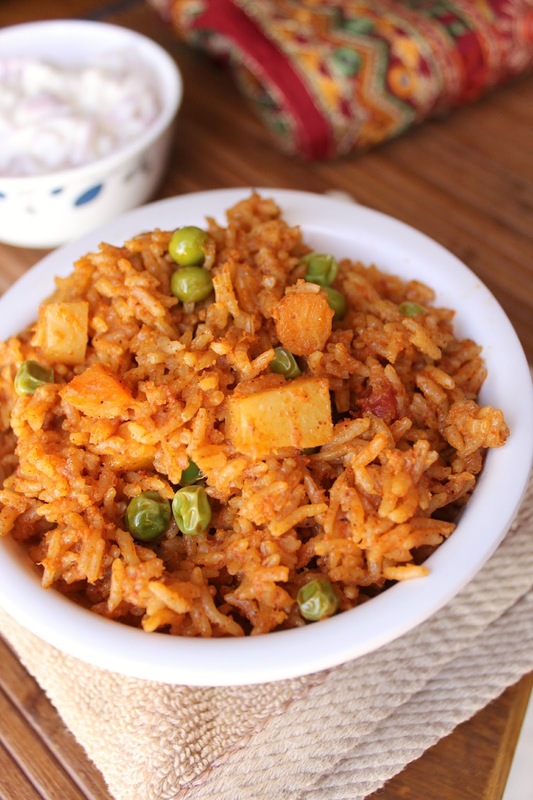 This entry was posted in One-pot dishes, Rice & Biryani and tagged Blogging Marathon, maharashtra cuisine, maharashtra rice dish, recipe, rice, varahadi bhaat, varahadi masale bhaat. love the vibrant colour of the rice..lovely clicks and like that fabric in the background. Am very much drooling here over that flavoursome masale bhaat, wat a colour and irresistible food. Looks hot and spicy masala bhaat……… Tempting clicks! Varhadi style is usually spicier than what we make. You got a nice color on the bhaat with all the spices. delicious and wholesome one pot meal.. I understand that it is a very flavorful and popular rice. Good one. The bhaat looks so wonderful Jayanthi..lovely colour on the bowl..
That is one delicious and filling rice dish. Such a healthy and filling,comforting one pot meal,looks super delicious. Very delicious one pot meal! Wow Jayanthi this rice looks so delicious. I had all but forgotten it. Thanks aap ne yad taza kar di. It one delicious presentation. wow jayanthi this masala bhaat version is mouthwatering and too gud 🙂 very delicious dish indeed .. awesome presentation and clicks ! !